What is Employee Engagement Hub? VIP Crowd Employee Engagement Hub is an employee engagement platform that leverages feedback, performance analysis, and gamification to help companies empower their employees to become highly efficient and productive assets, boost sales and revenue growth, and improve both customer and employee retention. 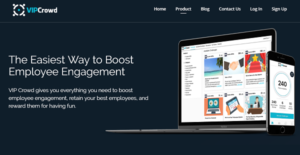 With VIP Crowd Employee Engagement Hub, companies find it easy to connect with their employees and convert them into brand ambassadors via training, advocacy, feedback, and recruiting. Discussion boards and forums fuel the creation of employee community, where each and every employee can discuss ideas, collaborate with each other, share best practices and more. The application allows upper management to discover top talents and identify their best performers, making it easy for them to further reward their best employees via gift cards, fun products, and other incentives while at the same time, encourage other workers to deliver excellent output. With VIP Crowd Employee Engagement Hub, your HR professionals can easily post activities or “challenges” that motivate your employees to participate, provide feedback, become advocates for your brand, and play for recognition. In return, your employees score points which they can redeem for rewards. Other gamification methods such as leaderboards, weekly games, and streaks have proven to be highly effective in keeping employee engagement high, resulting in optimized productivity and efficiency at all levels. Your HR Department doesn’t have to assign personnel to manage rewards for employee engagement. VIP Crowd Employee Management Hub does the work for them so they can fully concentrate on working and improving employee engagement and nothing else. The software monitors point accumulation and redemption, enumerates all rewards, and handle all inventory and shipping, taking care of all the heavy lifting so that your employees are rewarded accordingly. Get your employees talking and interacting with one another via discussion boards! VIP Crowd Employee Engagement Hub provides them with a place where they can get together and talk about anything about work and more, like sharing best practices, giving suggestions, and working on great ideas among other things. What Problems Will Employee Engagement Hub Solve? 1) Challenges can be created for anything that would help the company grow and become more successful. If you are considering Employee Engagement Hub it could also be sensible to check out other subcategories of Best HR Software listed in our base of SaaS software reviews. Each enterprise is different, and can require a specific HR Software solution that will be adjusted to their company size, type of customers and staff and even individual niche they cater to. It's not wise to count on locating a perfect services that is going to work for every business no matter what their history is. It may be a good idea to read a few Employee Engagement Hub reviews first and even then you should pay attention to what the service is supposed to do for your business and your employees. Do you need an easy and straightforward solution with only basic functions? Will you actually use the complex functionalities required by pros and large enterprises? Are there any specific tools that are especially beneficial for the industry you work in? If you ask yourself these questions it will be much easier to get a solid software that will fit your budget. How Much Does Employee Engagement Hub Cost? Contact VIP Crowd for basic and enterprise pricing information on their Employee Engagement Hub product. We realize that when you make a decision to buy HR Software it’s important not only to see how experts evaluate it in their reviews, but also to find out if the real people and companies that buy it are actually satisfied with the product. That’s why we’ve created our behavior-based Customer Satisfaction Algorithm™ that gathers customer reviews, comments and Employee Engagement Hub reviews across a wide range of social media sites. The data is then presented in an easy to digest form showing how many people had positive and negative experience with Employee Engagement Hub. With that information at hand you should be equipped to make an informed buying decision that you won’t regret. Overall a great experience! Having an opinion, being honest and helping people along the way. What are Employee Engagement Hub pricing details? What integrations are available for Employee Engagement Hub? The product I feel is very interactive and helpful for the individuals wanting to feedback. And who doesn’t love free prizes!